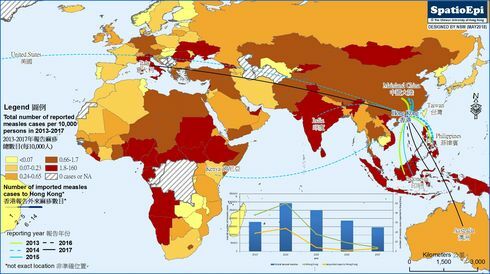 Data source: Data for the map were obtained from the U.S. Centers for Disease Control and Prevention (CDC). Before the introduction of the measles vaccine, measles outbreaks were widespread around the world. According to the World Health Organization (WHO), measles caused an estimated 2.6 million deaths each year in the pre-vaccination era. Nowadays, with high coverage of safe and effective vaccine, measles is an uncommon disease in the developed countries. In 2000, the United States declared measles eliminated, a target defined as the reduction of local new cases to zero. However, imported cases of measles could still occur. 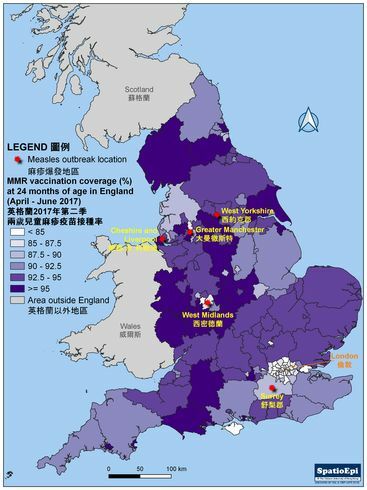 In areas with low measles vaccination coverage, local measles outbreak through on-going transmission remains a possibility. Between 1 January and 21 March 2019, a total of 314 measles cases were reported in the United States. 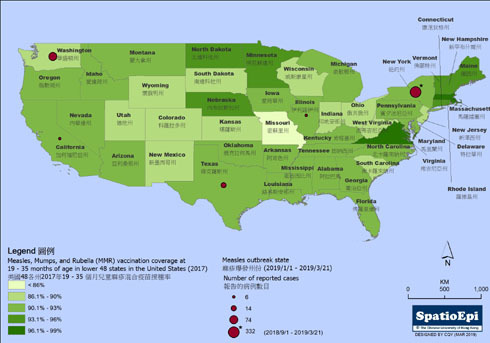 On the map, the states reporting measles outbreaks, defined as 3 or more cases, are shown in red dots, which include California, Illinois, New York, Texas, and Washington. The vaccination coverages in these states were below 93% in 2017. In particular, the coverage in Washington state was below 90%. The low coverage has enabled measles virus to re-emerge. Measles vaccination with MMR or similar vaccines is the most effective way to protect an individual against infection by measles, mumps, and rubella virus. On a population level, high coverage of vaccination is needed to achieve herd immunity, which indirectly reduces the infection risk of others in the community. Data for the map were obtained from the U.S. Centers for Disease Control and Prevention (CDC). Measles is a highly infectious disease caused by Measles virus. Incubation period usually ranges from 7 to 18 days. Affected persons present initially with cold-like symptoms, such as runny nose, sneezing and cough. Other early symptoms include fever, sore and red eyes and small greyish-white spots in the mouths. These are followed 3 to 7 days later by red-brown blotchy rash, which usually spreads from the head or upper neck to the rest of the body. The infection usually clears in around 7 to 10 days, and lifelong immunity will be developed. Serious complications like pneumonia and encephalitis do occur, and could cause death especially in children under the age of 5. Measles virus can be spread by droplets that come out of the nose and mouth from an infected person during coughing or sneezing. The virus can also be transmitted by direct contact with nasal or throat secretions of infected persons, or articles soiled with nasal or throat secretions. An infected person can be infectious from the time of symptoms development until about four days after appearance of the rash. There is no specific treatment for measles, but vaccination is effective to prevent the disease. Measles, mumps and rubella (MMR) vaccine can be administered by injection for immunisation against measles. Children should follow the recommended schedule of local childhood immunisation programme for vaccination.